Important note : I added the fourth and fifth tunes recently. If you bought the version with only 3 tunes, then send me an email with one of the tabs attached (your proof of purchase) and I'll send you the lesson/tab of the additional tunes for free. Lightnin' recorded this short instrumental when he was rediscovered by Mack McGormick in 1959. He didn't record many slow instrumentals so this is kinda special. The recording session was very informal and Lightnin' was in great form. Although short it contains many of his typical licks. You can find the original on the excellent cd "Country Blues" Tradition TCD1003. I transcribed the full song and explain/demonstrate it in great detail. 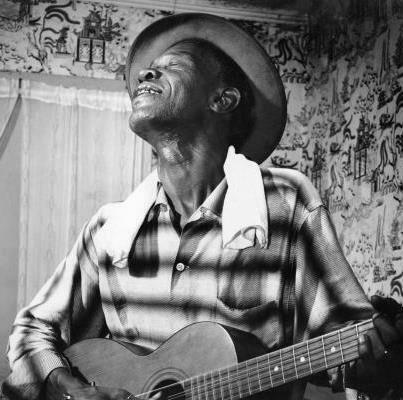 Many artists were influenced by Lightnin' so it's no wonder that Louisiana Swamp Bluesmen like Silas Hogan and Lightnin' Slim' owed much to Lightnin's way of playing in the key of E when they recorded their versions of "Hoodoo blues". I used Silas Hogan's accompaniment for this song and adapted two typical Lightnin' solo's. I tabbed out the intro, the first verse and the two solo's. The two short variations in the second and third verse are also explained in the video. Here's what you can do if you take a simple song, in this case "Talk With You" by Danny Kirwan/Fleetwood Mac, and put some Lightnin' licks in the shuffle. I also used some licks played by Geoff Bradford and Pat Donohue. So I ended up with a modern sounding blues with lotsa Lightnin' licks. A simple instrumental in the the key of A but in drop D tuning, tuned a half step low (like Lightnin' often did), that results in C# G# C# F# A# D# low to high. The drop D tuning has the advantage of being able to use the open D string when playing the IV chord. The tuning down has the advantage of easier bends because of less string tension. One of Lightnin's most moving and introspective songs, it really has a special eerie qualitiy. His mentor, Texas Alexander, was a certain influence for this song. Also in the key of A and in drop D tuning, tuned a half step low, C# G# C# F# A# D# low to high. I transcribed the full song, 4 pages of tab and 30 minutes video.